The NCRGE shared findings from NCRGE’s First Three Years work with The Council of State Directors of Programs for the Gifted at their meeting being held at the National Association for the Gifted annual conference in Minneapolis, MN. NCRGE also shared findings from the NCRGE EL Study. NCRGE Director Del Siegle has been named a 2018 Distinguished Scholar in gifted education by the National Association for Gifted Children. EdWeek (http://blogs.edweek.org/edweek/learning-the-language/2018/10/identify_gifted_and_talented_english_learners.html) featured recent NCRGE findings on ways to better identify gifted EL students. The National Center for Research on Gifted Education (https://ncrge.uconn.edu) is seeking a qualitative researcher for a PhD level Post Doctoral Research Associate position. 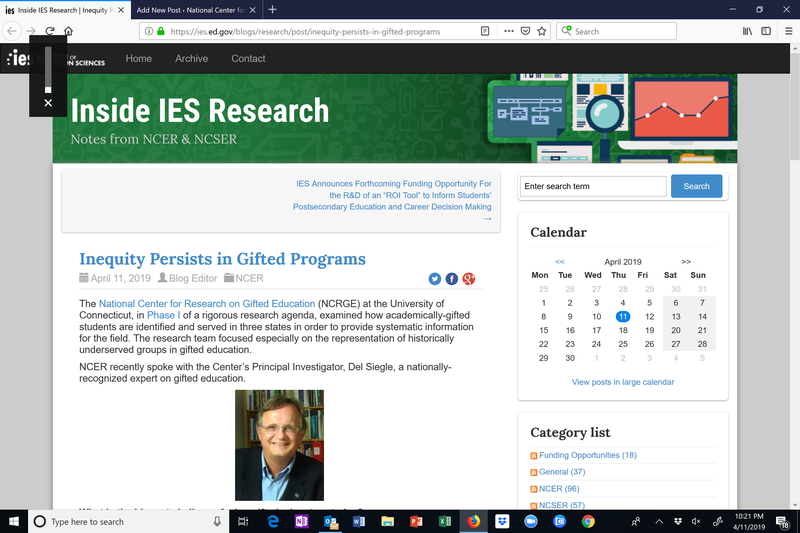 Check out a recent radio appearance by NCRGE Researcher, Dr. Del Siegle, in which he discusses some of the NCRGE team’s recent work on strategies to better identify EL students for gifted programs. The research is supported by a grant from the Office of English Language Acquisition (OELA) administered by the Institute of Education Sciences (IES). Dr. D. Betsy McCoach shared recent NCRGE research at the 2018 AERA Annual Meeting in New York City. She presented “Understanding Excellence Gaps: What can we learn from studying within school variability ” as a member of a panel on “Are Excellence Gaps the Unavoidable Consequences of Expanded Opportunities for High-Performing Students?” Her co-authors on the paper were Rashea Hamilton and Daniel Long. National Center for Research on Gifted Education (NCRGE) Director Del Siegle recently shared NCRGE research on the under identification of gifted students of poverty with The Columbus Dispatch. NCRGE Researcher, Dr. Betsy McCoach, discussed some of the NCRGE team’s recent work showing that students in poverty are less likely to be identified gifted in a radio interview on Wi-AM.com. The research is supported by a grant administered by the Institute of Education Sciences (IES).